Since first hearing about the Camino back in 2004 I have been privileged to make three Caminos - each one longer than the last, and each one having fewer pilgrims than the one before. However 2012, in many respects, is very definitely going to be the "Road Less Travelled". Though still a pilgrimage, it is not on the Camino. Instead, the destination is Rome, on a path called the Via Francigena - officially from Canterbury to Rome, but as I will be in London with a few days to spare I will begin there? 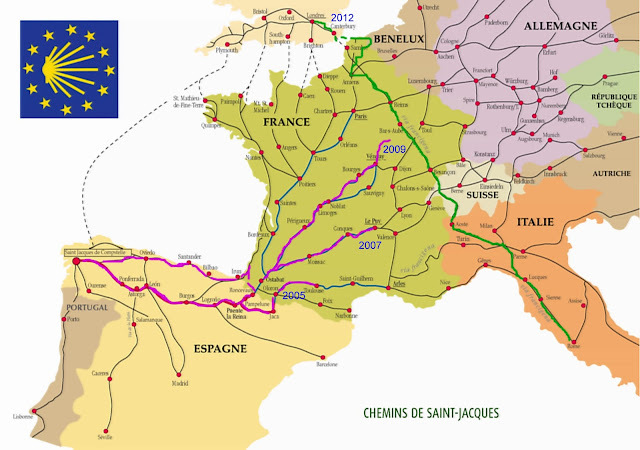 I estimate that it will be about 2,200kms in length, due to the extension from London, but also a detour that I intend to make through the Western Front. When I arrive in Calais, instead of going "straight on" I will turn left and head to Dunkerque. From there I will head across to Iper (formerly Ypres) in Belgium where I hope to attend the last post ceremony at the Menin Gate, before heading off to France in a zig zag pattern through the Western Front so that I can visit the important Memorials along the way, to the prime destination for this part of the journey – Villers-Brettoneux. Here I will attend the Anzac Day Dawn Service at the Australian War Memorial before picking up the Via Francigena again and heading through France, over the Col St Bernard in the Swiss Alps and ultimately Rome. Except for the few kilometres that I have walked around London, this path is totally new to me. I am expecting to see a few walkers as I make my way down the Thames and along the North Downs Way to Dover, and I suspect that I will see many Aussies and Kiwis on the Western Front, but once I leave that, I suspect that the only people I meet, until I get near the Alps, will be the locals. This Pilgrim's Path is not well travelled compared to the Camino and so having had little chance of a good English conversation for about 7 weeks I will be no doubt very glad to meet my sister Carol and sister in law Elizabeth, when they join me in Pavia in Northern Italy.